The Colorado Street Bridge in Pasadena. Photo by Steve Hymon/Metro. Time Out Los Angeles and Curbed LA have both come out with guides on the spookiest, most haunted places around Los Angeles, and here are the thirteen that are the most transit accessible if you’d like to Go Metro to get your scare on. Colorado Street Bridge (photo above): a historic landmark that spans the Arroyo Seco built in 1913, also known as…well, I won’t say it here. 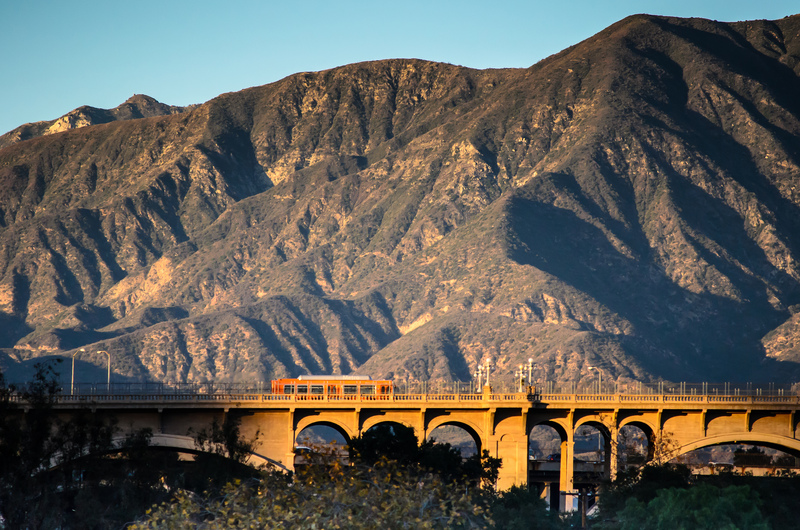 Visit the bridge via the Gold Line Memorial Park Station or take Metro Bus 256 to Orange Grove/Colorado. Grauman’s Chinese Theatre (TCL Chinese Theatre): said to be haunted by actor Victor Kilian. Visit the theatre via the Red Line Hollywood/Highland Station or Metro Bus 212/312 or 217 to Hollywood/Orange. Hollywood Pantages Theatre: rumored to have two ghosts in residence. Visit via the Red Line Hollywood/Vine Station or Metro Rapid 780 to Argyle/Hollywood. The Knickerbocker Hotel: the hotel is currently a retirement residence, but it’s supposedly the most haunted place in L.A. Visit via the Red Line Hollywood/Vine Station or Metro Bus 212/312 or 217 to Hollywood/Ivar. The HMS Queen Mary from across the bay. 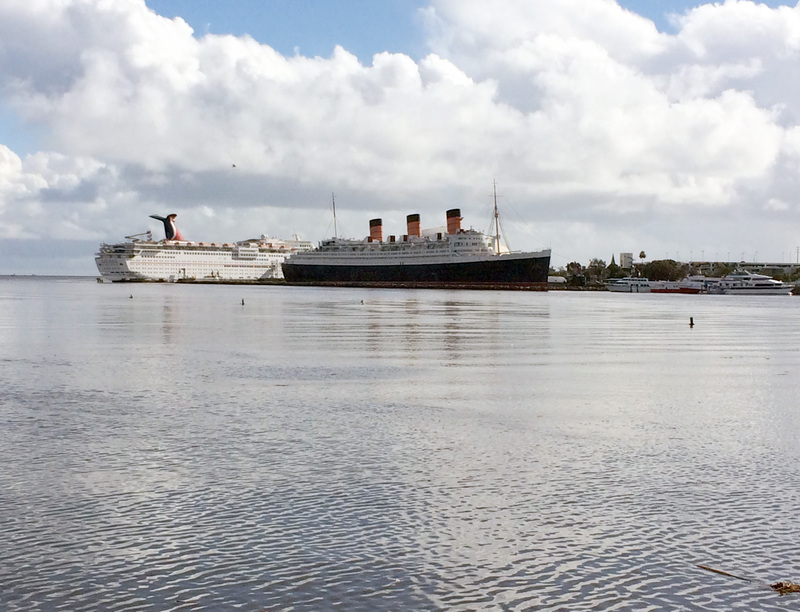 The Queen Mary: a ship full of ghosts. You can even spend the night, if you dare. Visit via the Blue Line Downtown Long Beach Station + free Passport shuttle bus. The Alexandria Hotel: formerly hotel, now apartments. Story time — before I moved to Pasadena, I used to live at the Alexandria. I never once saw a ghost or felt any spirits attempting to make contact the entire two years I was there. However, a friend of mine came to visit me once and swore she saw the ghost of a crying woman. After that she refused to visit my place after dark. Visit the Alexandria via the Red/Purple Line Pershing Square Station or the Metro Rapid 728 to Spring/5th. Also near a Metro Bike station. The Hollywood Roosevelt Hotel: home to numerous silver screen ghosts, from Marilyn Monroe to Humphrey Bogart. Visit via the Red Line Hollywood/Highland Station or Metro Bus 212/312 or 217 to Hollywood/Orange. Bullocks Wilshire: Lovely art deco building haunted by a little girl. Visit via the Red/Purple Line Wilshire/Vermont Station or Metro Bus 20 to Wilshire/Westmoreland. Los Angeles City Hall: great observation deck, and also the place to find ghosts apt to disrupt city council meetings. Visit via the Red/Purple Line Civic Center/Grand Park Station or numerous downtown bus lines. Also near a Metro Bike station. Millenium Biltmore Hotel: Last place the Black Dahlia was seen alive. I personally have never seen her ghost there, but I enjoy their afternoon tea. Visit via the Red/Purple Line Pershing Square Station or numerous downtown bus lines. Also near a Metro Bike station. Culver Studios: said to be haunted by filmmaker Thomas Ince. The studio is not open for public tours but you can stand in front of it for photos (and maybe a ghost sighting). Visit via the Expo Line Culver City Station or Culver City Bus to Culver/Main. Pico House: people say it’s definitely haunted, but no one’s sure who the ghosts are. Visit via Union Station. Hotel Cecil (Stay on Main): the hotel has such a dark and gory past that it inspired a season of American Horror Story. Visit via the Red/Purple Line Pershing Square Station or Metro Rapid 733 to Main/7th. Also near a Metro Bike station.